Life of animals other than so called social animals, isn’t it fascinating? Have you ever thought of animal’s daily life? Have you ever wondered how animals would spend their time and perform their day to day activities? Then yes, there is nothing to be surprised about! Animals have their own life and daily activities!It may not be as systematic and organized like that of ours but they have their own way to express their emotions. 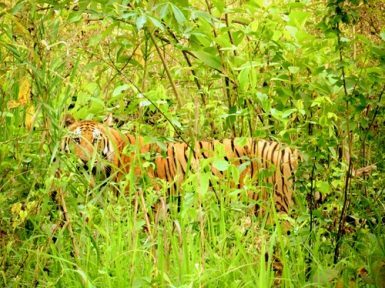 Get acquainted with the wildlife in the dense forests of Nepal. Jungle safari is an opportunity to get close to the wildlife in its natural habitat in a natural phenomenon. Encounter a Bengal tiger chasing its prey! See a one – horned rhino as it heads towards the bank of river for drinking water. Watch the peacock dancing in the rain. Nothing could have been more awesome than seeing a monkey feeding its cute little baby! Ride on the back of an elephant and view the tiny wildlife above and below you. The varieties of migrating birds chirping, the parent birds feeding their little ones, the Eco system could not have been more inspiring. Nepal Hiking Team has designed few packages that offers you an opportunity to explore the wildlife from very close. Go to national parks in Nepal like Chitwan National Park and Bardia National Park! 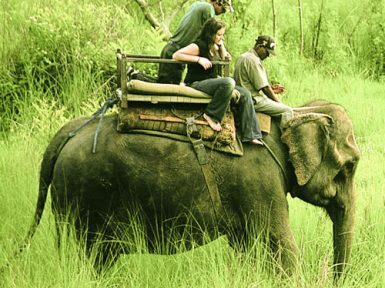 Ride on a jeep or an elephant and travel in between the jungles. Stay on a tent, enjoy the campfire and barbeque! Life could not have been better!